May God bless you in abundance this New Year 2007. It’s now getting quite tough to take care of 270+ adopted ministers, and to make sure that there are enough funds for them every month. So I am con stantly praying for blessings for all the sponsors like you. I know God will continue to bless you because through your financial support you are sharing His ‘good news’ to those who are still in darkness. Your monthly donation is a big help to us because funds seem to leave us so quickly for overseas work. The adopted ministers have done a great job. The number of baptisms this year in the Philippines alone is tremendous. I don’t have the exact figure yet, but it will be close to 20,000 precious souls. Isn’t it wonderful to be a part in bringing these precious souls to His kingdom? God is calling everyone, and they are responding to His call. Please help us pray that the Holy Spirit will nurture their growth so they all will be ready for Jesus’ soon return. 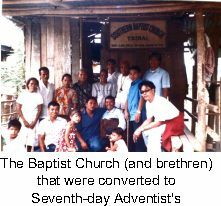 Adopted minister, Eliezer Calinga of Northeastern Mindanao Mission sent these pictures of a Southern Baptist Church Tribal and the brethren there who have converted to Seventh Day Adventists. Indeed, God is calling His other sheep from other pastures. 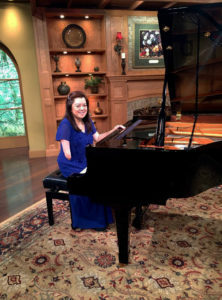 It thrills me to have a part in God’s work. I know you must feel the same, for your big support for this ministry has made this wonderful happening possible. It will be a great day indeed when we’d meet all the precious souls brought to the kingdom through this ministry that God has given us all. But look at the picture of this poor church building. I wish God would send us blessings so we could build them a little bit better church than what they have now. 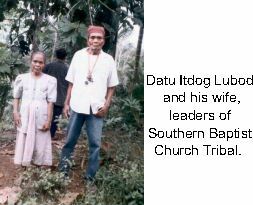 This is Datu Itdog Lubod, the Datu of the Tribal Group. He is the Leader of the Southern Baptist Church Tribal. He’s also the owner of the lot where the Baptist church was built. 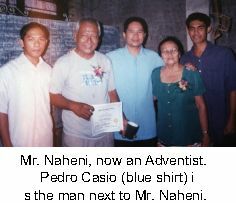 I received this picture from Pedro Casio, an adopted Theology student. Pedro has a special gift to spread the good news to people who are tough to approach about Jesus and the Bible truths. 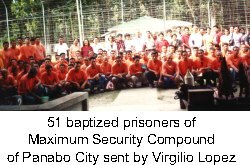 One of Pedro’s converts was a Catholic priest, two nuns, and other denominational leaders.